THERE IS NO shortage of cheap Android phones out there on the market so anyone making one has to make a serious effort if they want to stand out. 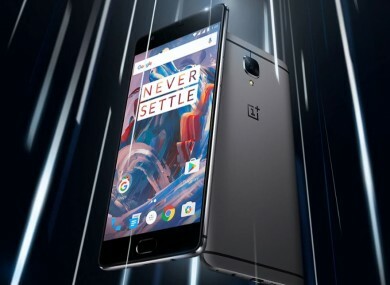 One which is planning to make an impact is OnePlus, which has launched the third edition of its more budget-friendly smartphone range. The Chinese startup made a name for itself by offering a phone with close to premium components for the price of a mid-range device and has a very dedicated fanbase because of it. The 5.5-inch device costs €399 and comes with a 1080p display, a Snapdragon 820 processor, 64GB of storage (but no expandable storage), a 16MP camera, 6GB of RAM, and a smaller 3,000mAh battery. The design of it does take inspiration from the likes of Apple, HTC and Huawei with an aluminum body and home button doubling as a fingerprint reader. The specs are higher than what you would usually expect from a budget phone, but it seems to have learnt from the mistakes of its previous phones. It runs on a custom version of stock Android called OxygenOS, which offers minor tweaks to Google’s operating system. Probably the biggest change is how it has ditched the invite system. Previous phones from OnePlus required you to sign up to a waiting list or get codes from friends so you could order it – which made getting one so frustrating. While it was only announced last night, a number of reviews have emerged. The overall consensus is that while it has its flaws, it’s one of the best phones in that price range. CNET said while it won’t satisfy everyone, it is an “amazing and affordable” device thanks to stable software and a solid camera. I try to remain skeptical of anything that garners as much hype as the OnePlus phones do. Following its first two flagships, OnePlus cultivated a loyal fanbase. But lo and behold, the OnePlus 3 lives up to its promise. WIRED’s review was more considered, saying that it’s a great phone if you’re looking for horsepower, but not if you’re looking for consistency. The Verge was more impressed, saying that while it had its flaws, OnePlus has learnt the lessons from its last phone. The OnePlus isn’t perfect… depending on your priorities, it might not have everything on your wish list. But it’s a significant step forward for OnePlus, in terms of both quality of the product and how you’re able to buy it. It’s also a step forward for the industry as a whole: it’s a device that keeps pace with much more expensive products while costing much less. The OnePlus 3 is the rare kind of phone that I can recommend without reservations. While Engadget said it “represents the best balance of price and performance you can find”. You can certainly do better if you’re fine with spending more money, and there are better deals to be found if you’re not a stickler for high-end performance. The careful balance OnePlus has struck here is impressive, though, and while the OnePlus 3 isn’t for everyone, anyone looking for high quality without the corresponding price should start their search here. Another one to keep in mind should you be searching for a new device. Email “This cheap flagship smartphone is out and it's impressing people*”. Feedback on “This cheap flagship smartphone is out and it's impressing people*”.